Winding Drive is a small producer of handmade award winning Jams, Jellies, Marmalades and now BBQ Sauces and pickles. Specializing in unique flavor combinations such as our award winning Blueberry Limoncello Jam or Habanero Gold Jelly and hard to find old time favorites like Crabapple or Elderberry Jelly. Fran and Ron founded Winding Drive in the summer of 2008, specializing in gourmet jams, jellies and marmalades. The product is made by hand in small batches and is characterized by unique flavor combinations, as well as traditional fruit flavors. When selecting fruit for their gourmet specialties, Fran Adams and Ron Pinto, a husband and wife team, place an emphasis on seasonally fresh Connecticut grown fruit. And how did they get started? Ron’s job in sales and marketing was eliminated in the spring of 2008. “Idleness is not part of his makeup, he needs to be busy,” said Ms. Adams. A self taught cook, she saw on opportunity to sell homemade jam and help Ron stay busy. 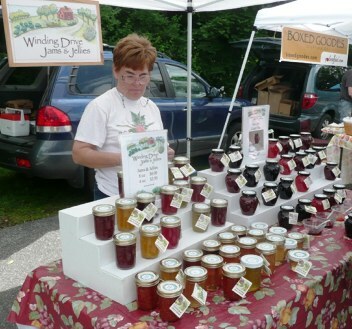 They started selling their jams at local farmers markets including the Litchfield Farmers Market. Customers loved the locally grown, no preservative, jam. While working full time in the insurance industry, Ms. Adams continued to make several batches each week. The customers continued to buy. As they say, the rest is history. Today, their company continues to grow and their varieties expand; flavor combinations are always being developed; a commercial kitchen was installed and retail distribution is a reality. Ron and Fran are very busy! More information is available at WindingDrive.com or by calling 203-263-6961.